Charles Joseph Bishop was born on 6 June 1794, the fourth son of Samuel Willson Bishop, a London merchant who retired to Oxford. When Charles’s two eldest brothers were matriculated at the University of Oxford (William Bishop from Wadham College at the age of 17 on 12 May 1793 and Samuel Willson Bishop from Merton College on 14 March 1797, aged 18), the family was still living in St Andrew’s parish in Holborn, London. But when the next brother, Henry Bishop was matriculated from Oriel College on 7 June 1810, the family was living in Oxford. Charles himself spent some time in Spain as a merchant, but returned to England at the age of 22 and was matriculated at the University of Oxford from St Mary Hall on 5 December 1816. He obtained his BA in 1820 and his B.Med. in 1824. In 1826, the year he is recorded as attending Daubeny’s lectures, he gained his D.Med. Botany, however, rather than medicine was his main interest, and he was also a classical scholar. 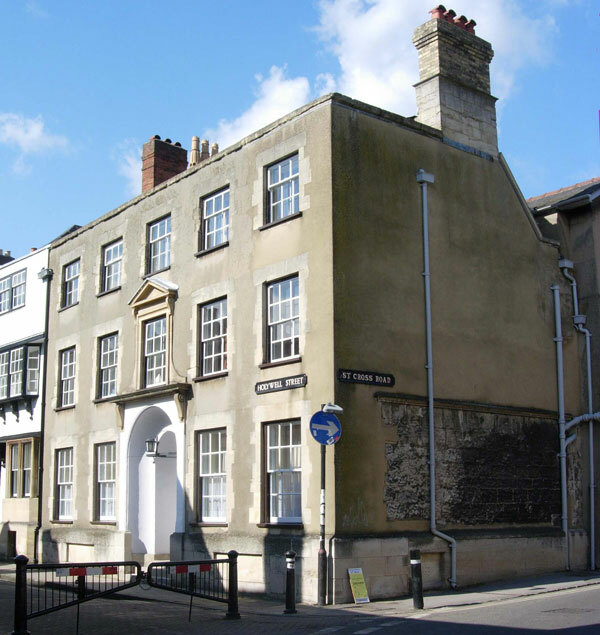 Bishop practised from his father’s house at 1 Holywell Street (below). Bishop first applied to be Physician to the Radcliffe Infirmary in 1826, but Daubeny got the job. When another vacancy occurred in 1830, he was successful. Mary Ellen Bishop (baptised at Holywell Church on 30 November 1835). Martha Grace MacLean Bishop (baptised at St Thomas’s Church on 29 May 1839). Mrs Elizabeth Bishop was still living at her father’s house with the children at the time of the 1841 census. Soon after this she remarried: her new husband was another doctor, the surgeon Thomas Richard Fisher.